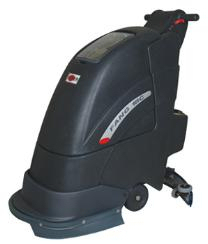 The FANG 18C is a cord-electric compact walk-behind scrubber dryer. Attractive design and well balanced. Simple and easy to use. Delivered fully equipped and ready to use. With this compact scrubber dryer you can easily clean the floors in one single pass.It is easy to service and maintain all kinds of parts as this machine is service-friendly. A high pad pressure of 30 kg will clean the floors easily.The FANG 18C will be delivered including pad driver, squeegee and 25 metre cable.